So, my sweet potato vine grew a potato. This has never happened to me before, I actually thought a pesky squirrel had buried something in my window box! So I 'dug it up' and whooops, there went my vine. Something doing much better than the now-dead sweet potato vine is our mums. They are STUNNING this year! They are around three feet across, big balls of gorgeous. They started as $5 Home Depot specials two years ago. I had planted four, and only these two came back. My mom is dying of jealousy, she can't get any mums to come back and I don't do anything special to these! No purposeful watering, no fertilizer, no winter protection, no pinching back, nothing. How can they not be touching anymore? It's like the one on the left took some steroids and then heaved over 6 inches. A 'mum' mystery, I tell ya! those mums are awesome. and it is weird how they have slowly grown apart. very interesting. As if the sweet potato wasn't impressive enough, those are some magnificent mounds of mums! Brilliant fall color, too. Aren't mums weird how they grow and even change color sometimes? I planted some potted mums a couple falls ago, and they didn't come back the following spring. :( I also never really tended to them, but maybe that had the opposite effect on my mums. That is INSANE. 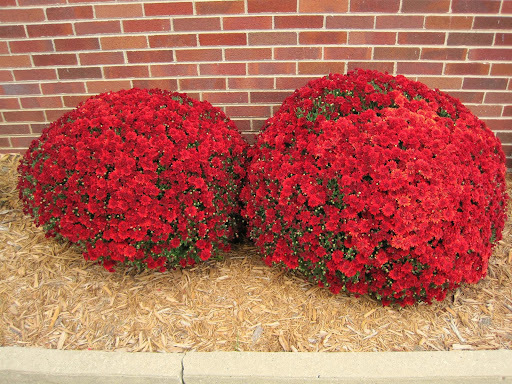 I've never seen mums that big. Now I want some! Crazy! I thought mum's were supposed to be annuals? Now I'm glad I picked pretty, all-season colors for ours, just in case. Wow, girl, those are gorgeous!!! Holy Cow! Those Mums are amazing! I've never like mums, but I've never seen any that look like that--I might have to change my stance on them! Those are awesome!! Only in the last couple of years did I find out they were perennials around here. Now the ones I have are tall and leggy and don't bloom. Turns out you're supposed to cut them back and keep them short so they'll do what yours have done on their own! They are beautiful. They needed their own space .... hahaha. That's too funny about the moving mums - they look so pretty! Your mums are gorgeous! I planted some for the first time this year and was especially excited to find out they were perennials. Since football season is in full swing, I decided to go with orange and white (Vols colors) for a surprise for my hubby (a huge Vols fan). Not even a week later, my orange and white turned to yellow and whitish/pinkish color. Ooops! Oh well, they're still pretty and I hope mine come back next year like yours! Wait a minute! I thought sweet potato vines were ornamental... yours grew a real potato?! Why didn't mine ever do that? Those are the biggest mums I've ever seen! First of all, I never put two and two together that sweet potato vines actually could produce potatoes. Really? Can you eat it? And, the MUMS.ARE.KILLING.ME. Mine have gone crazy and gotten huge, but they are not nearly as neat as yours. Yours are just perfection. They must have the perfect spot. My mom says they are persnickety. Those mums are AMAZING!! They are ridiculous!!! Those mums blow my mind! I always forgot to pinch them back at the old house so they always looked weird in the fall. Amazing! i didn't even know mums came back! I hope my little guy returns next year. It started with yellow flowers, but when I deadhead - they come back orange. Mums are crazy. Seriously chortling that you got a sweet potato!